The votes are in and the 1st Place winner of Best Coaching Blogs 2012 is Life Coach Vatsala Shukla of India, who did a brilliant job of mobilizing her voters, despite India's massive 2-day power outage, which plunged one tenth of the world's population into darkness, making it the biggest loss of electrical power in world history. Since its first year in 2008, Best Coaching Blogs finalists have been decided by a combination of popular votes and comments left by fans. But in the end, the contest finalists themselves, choose 1st, 2nd and 3rd Place winners via a closed ballot. There were key changes in this year's contest, which for the first time, was formatted like a blog. Each blog entry appeared as a separate blog 'post', with a link to the blog itself, plus a comments section and social sharing buttons, like those at the top of this post. Social shares counted as votes and comments were used as tie-breakers. The 'down vote' option that coaches disliked in previous years, was removed and voters were allowed to vote as many times as they liked. This produced a competition that was both more cordial and more social. Vatsala's Tips for a Stress Free Life Blog quickly took the lead in both popular votes (social shares) and comments and it prevailed in the finalist's closed vote. 2nd Place went to Evelyn Kalinowsky's Inner Affluence blog and 3rd to Gerard Corbett's PR Job Coach blog. Rachel Grant Coaching blog and Andrea Feinberg's More Free Time blog rounded out the Top Five Winners. Angela Goodeve's* new blog, Life Advice the Coaching Way, received an Honorable Mention. 1st Place: Vatsala Shukla: "My blog Vatsala’s Tips for a Stress Free Life had just completed its first year of existence. Entering the competition was my challenge to improve myself. Friends and associates told me my posts were good. That was expected as they know Vatsala the person in all her multi-roles of finance professional, life coach, daughter, pet parent and friend. They understood the context in my writing. What about the world? Was my blog up to the mark? So I entered the competition and was accepted. I was elated. It was only after I started reading the blogs of my fellow competitors that I realised that I was competing with the best of the best. My challenge to step out of my comfort zone went a step further to hold my ground against great veteran bloggers whom I have over the last 4 weeks added to my must read list! Receiving the largest public votes and comments was confirmation that readers liked what they read. Winning from the finalist voting round validated it. I am overwhelmed, humbled and grateful for my win which means a lot more to me than I can articulate. My next challenge is to honour the voters and finalists by being my best." Top Five: Andrea Feinberg: "Thanks for the opportunity to participate in this contest and end up a winner among the Top 5, my first time! We each have such different targets and I see that as a testament to the swift and broad expansion of professional coaching throughout personal and business sectors. Congratulations to my fellow finalists; we enjoyed the validation of our work through the strength of our supporters who both voted and commented on our behalf." Honorable Mention: Angela Goodeve: "Yay!!! Thank-you, thank-you, thank-you! It was a great experience participating in the contest, and I am so flattered and proud to be given the Honorable Mention! I love writing the blog posts in the hope that they will provide inspiration, "food for thought", tips, and guidance to improve people's life for the better...and give them an idea of what the wonderful world of Life Coaching can do for them! I am grateful to you Julia for being a great Mentor and Teacher, and for challenging me to join the contest, and open up more possibilities for me and my business!" As always, the Best Coaching Blogs Contest is a fun way to expand the conversation about the benefits of business and life coaching. Plus it highlights the many varied approaches that coaches take to empower their clients and it builds awareness of the incredible growth of professional coaching, which continues to be the second fastest growing profession is the world. Thanks to the coaching bloggers who participated. I hope you all attracted new readers and clients by taking the courageous step to enter your blog. I look forward to next year's contest and the connections that are built between coaching bloggers themsleves, as well as with their new fans. 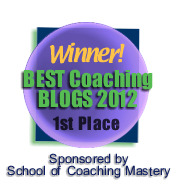 Congratulate the coaching winners below and visit the Best Coaching Blogs 2012 . *Full disclosure: Angela Goodeve is a life coach student at School of Coaching Mastery.